I was looking to make an easy but yummy recipe this week. When surfing around on the internet, my Mom and I came across 2 Ingredient Pancakes. The problem with that recipe was that there were more than 2 ingredients! In my recipe, there are exactly 4 ingredients. My Mom and I adapted this recipe from the Top it With Cinnamon blog and made it chocolatey. 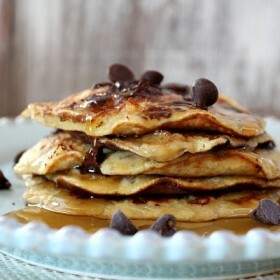 I LOVE how simple these 4 Ingredient Chocolate Chip Pancakes are. Even a toddler could make it!!! The more syrup, the better. I couldn’t eat pancakes without syrup. Well, except for my Mom’s Cinnamon Roll Pancakes. 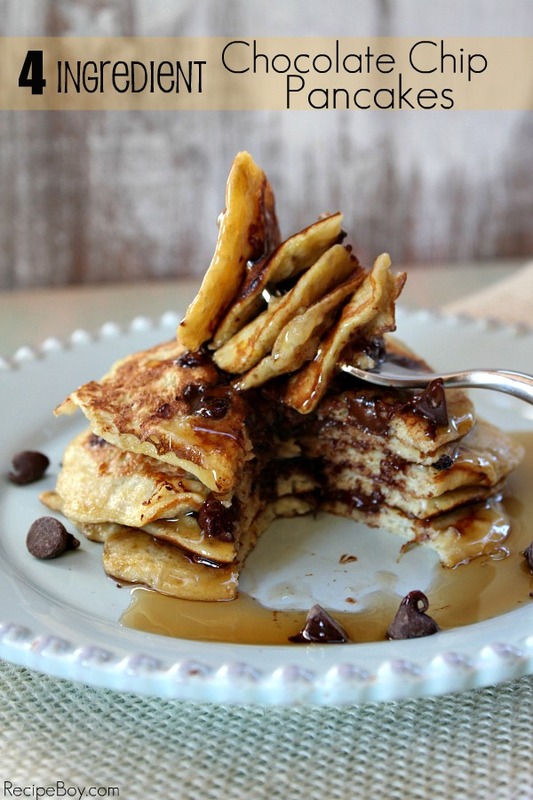 These Chocolate Chip Pancakes need syrup. Yummy. As I told you, even a toddler could make these pancakes. Imagine what a chef could do with them! The chocolate chips are optional, so you don’t have to worry if you’re on some kind of Starve-To-The-Death-With-Healthy-Stuff diet. My Mom seems to really enjoy Starve-To-The-Death Diets. She just finished a cleanse recently too. Don’t tell her I told you this, but she cheats on her cleanses. She threw out 4 bottles of juice that she didn’t like! Uh. If I did a cleanse, I would be licking up every last drop of that juice. Now back to the recipe. And even a kid can make very simple but yummy pancakes… Like Me! 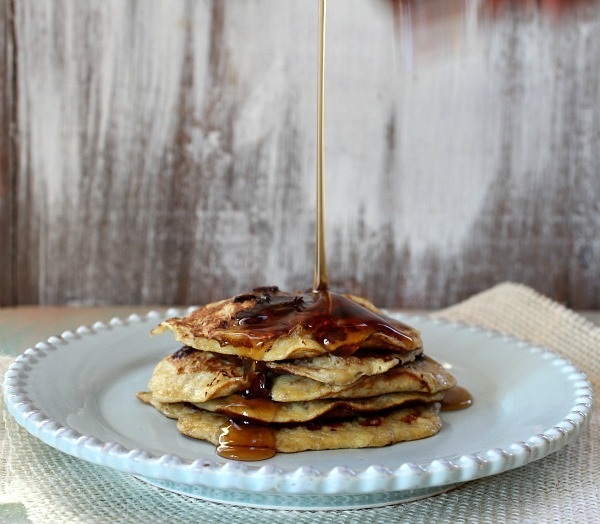 SUPER easy pancakes with just 4 ingredients! 1. Mix the eggs, banana and baking powder in a medium bowl. 2. Heat your griddle and spray with nonstick spray. Pour about 1/4 cup batter into the skillet and spread it into a circle. Let it cook until almost done on the bottom (light brown), then drop some chocolate chips onto the top of the pancake. Flip it over when the edges are dry and the bottom is pretty golden. It'll be a little messy and the chocolate will melt some. Cook just about a minute on the other side, then transfer to a plate. Keep cooking and flipping and stacking onto the plate. Top with syrup and eat! I could use a big stack of these right now! Mmmm! What?!? This is awesome! I’m going to have to make these (without chocolate) for my little boy. Perfection! These look amazing!! I have a new plan for my squishy bananas. I am so excited to try them! I am LOVING your blog! These look so tasty… I almost want to make them for lunch. And when I want pancakes, I make them for myself… cause my silly husband doesn’t like fluffy pancakes. I swear there is something wrong with him (he doesn’t like chocolate either). Reaching through my computer screen to take a big bite! (Wishful thinking.) Looks fabulous! Can you use like 4 egg whites in place of 2 whole eggs? @Marie I was thinking I’d like to try it with egg whites only. Let us know if it works! Wow just made these for breakfast and they were delicious!! Thanks so much! love the recipe. very modern, in some ways. like for exemple using just banana instead of flour. Sounds great! 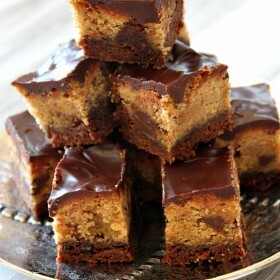 I will definitly try to make them! 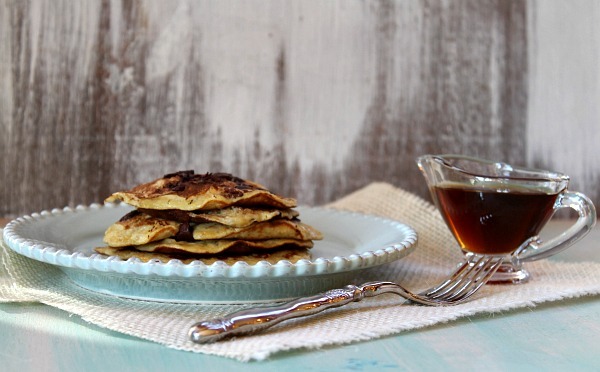 As it’s Pancake Tuesday, I tried these this morning — and they were excellent! I think my banana was a bit less than 1/2 a cup so some of the earlier ones were eggier than I’d have liked, but they definitely turned out better than I expected. Yay! The black bananas on my counter called out to me this morning and so did this recipe! I admit I added a tablespoon of almond flour (because my brain couldn’t comprehend the extreme liquid state of the batter-ha ha ). My two tips are, cook them below medium heat so they can get as cooked as possible (without burning) before you attempt to flip them AND think Silver Dollar size pancakes when you start making them. I made the mistake of making a regular size pancake on my first round and it fell apart when I tried to flip it. Silver Dollar size works much better. I also mixed my chocolate chips into the batter and that was fine as long as you scoop into the batter and be sure you snag some. Overall, they were a little eggier than I would prefer, but I’m glad I tried them I have a couple left over so I’m going to stick them in the freezer to see how they are after freezing. I always like to make batches of pancakes and freeze them for quick breakfasts! First let me say that I am a pancake snob, Pancakes are my favorite food and I’d rather not eat than eat a not PERFECT pancake. I was skeptical since there isn’t any flour but since I am trying to lower my carb intake but missed my pancakes I thought I would give it ago. 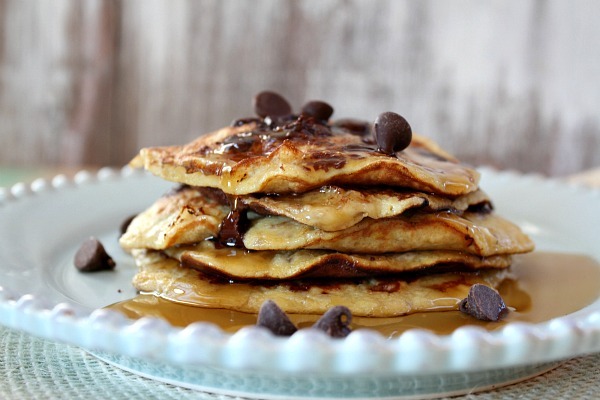 OMG these are amazing and no syrup needed. I added cinnamon, vanilla, and a little cocoa powder. I also cut the egg down to 1 and used some egg whites. This has totally opened my mind. I am going to try to make a small cake next weekend with this base and maybe a little almond flour. Thanks so much for this recipe! I didn’t have bananas, so I used pumpkin, and added a little almond flour and cinnamon. Now I’m addicted. Having the banana pancakes today. Dying to try this now. Except it’s 10.14pm. Tomorrow’s breakfast is in order! I was getting excited to make these since I’m allergic to eggs and dairy..too bad I’m also allergic to bananas, lol. They look amazing though! These are GREAT!!!!! I put datez and walnuts in mine. My boys loved these and they are very picky! Thanx! ! 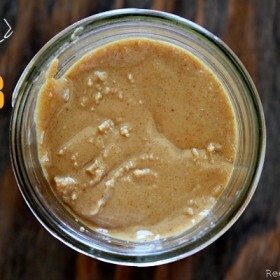 This recipe is so simple, perfect for my daughter to make! So I am…in your Mom’s words…really, really late to the party! I found your Mom’s version of these yesterday, made them today, and they were AWESOME! Right now I am on one of those “diet til you are thin or die trying” deals so no chips for me right now. However, I will be adding the pinch of baking powder next time…like tomorrow. So you are hilarious…keep cooking, young man!